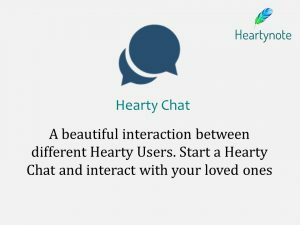 Heartynote – The Indian social network! 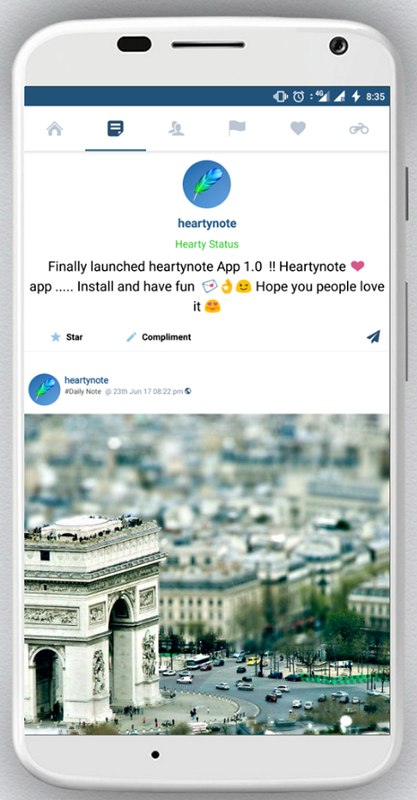 Heartynote is an Indian social network where everyone notes amazing moments with heart and treasure personal feelings with trust. The top Indian Social Network is Heartynote. These features are unique and brand new. Heartynote has got all the firepower to win the hearts of billions of people and emerge as the top Indian social network. Hearty Diary is an awesome feature of Heartynote which is used to treasure your day to day feelings and memorable moments of life. There are many things in life that need to be kept to ourselves. You have a secret? We will keep it safe in Hearty Diary! Privacy of an individual matters and the Hearty Diary is 100% encrypted. 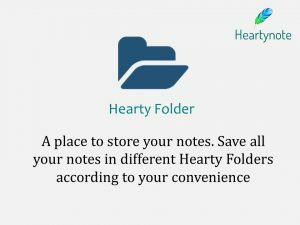 Hearty Folder is a place to store your personal notes at one place and also to showcase your stored notes to other Heartynote users. All your memories in one place at your fingertips! Hearty Folder for you! Hearty Status is a new way to express your vibes to the world. Whatever your mood or vibe may be, Heartynote has a way to make you feel better. Update your Hearty Status and witness Hearty happiness while your connections and followers drop in compliments and send in the awesome golden stars. Hearty Profile views is the total number of times your profile has been viewed by other Hearty users on Heartynote. The higher the profile views for your Hearty profile, the more popular you are. Make your profile as interesting as possible by being yourself and adding amazing notes every day. Hearty Badge is given to Heartynote users based upon their engagement and their popularity on Heartynote. The badges given are Pioneer, Dynamo, Achiever, Rockstar and Mystique. Login to Heartynote today and earn your badge. Hearty Chat helps you to stay connected with all your connections, followers and family. Hearty chat provides a platform for all the Hearty users to talk with all heart and share everything heart fully. Hearty Talk is a public chat where people can state their ideas, views, appreciations in a specific Hearty chain. The most popular chain topics will be displayed in the trending bar of Hearty Talk dashboard and every Hearty user has the freedom to either join or exit different Hearty Talks on Heartynote. Star is the feature used to appreciate a note. When you hit the star icon after viewing a note, the colorless star flashes and turns into a rich golden colored star adding beauty to the note. Compliment is the new way to shower love on a note. Why would we comment on a note when we can actually compliment? Drop in a compliment on amazing notes of fellow Hearty users and be the reason for a smile on their face. Renote is spreading happiness through your Hearty profile. Renote any note on Heartynote and the same note will be displayed on your Hearty profile. Refer is the updated version of sharing a note. In just one click, you can refer a note to all your connections and make them have a glimpse of every single interesting note you see on Heartynote. All these features add up to amazing Heartynote and make it the top Indian social networking platform. India is a land of feelings and cultures. Heartynote is designed in a way, where every single person from every different culture of the country can note with heart and spread the word of Hearty Happiness. Now that you have known the importance of treasuring memories, begin your Hearty journey with us. Install the Heartynote app now! This entry was posted in Uncategorized on August 20, 2017 by heartyblog7472.